Minnesota Vikings Helmet Riddell Speed 2013 - Current - Login for SALE Price | Sports Memorabilia! This Minnesota Vikings helmet matte finish change started with the 2013 season. The Speed helmet style debuted in 2010. Every Minnesota Vikings helmet is officially licensed by the NFL. Each Minnesota Vikings Speed helmet features a very distinctive, aggressive shell design, large size shell, special order facemask and four point chin-strap. 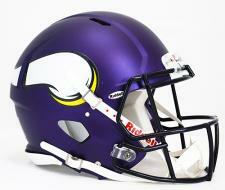 All Speed helmets, including this Minnesota Vikings helmet, come with official team colors and decals.